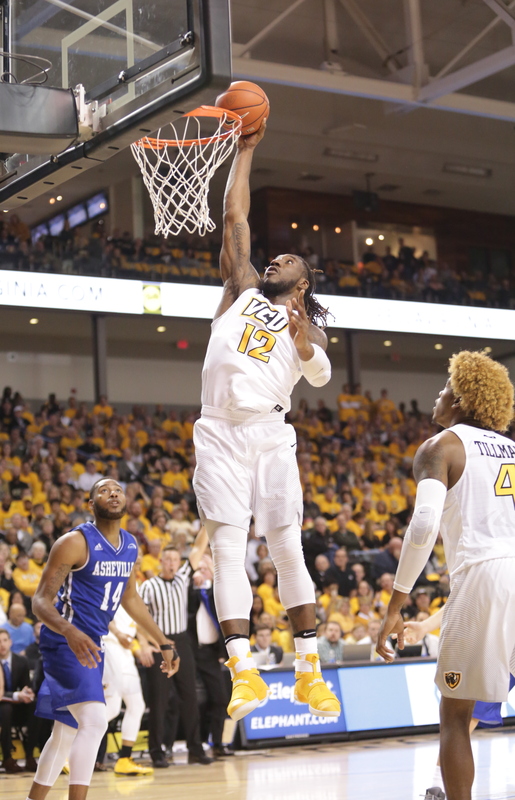 They are far from a finished product but tonight’s VCU Rams looked much-improved from a week ago, using a strong second half pull away from UNC Asheville, 80-65. The Rams took a six point lead into the half but carried some momentum with it, then came out to hit 63% of their attempts in the second while clamping down somewhat on the Bulldogs to cruise to the win. Head coach Will Wade mixed things up by bringing senior center Mo Alie-Cox off the bench in favor of Ahmed Hamdy after a strong week in practice, a move that sparked Alie-Cox to lead the Rams with a team-high 15 points in the win. Alie-Cox hit five of his seven attempts on a night the Rams shot 55.4% from the field. The VCU big man was one of three Rams to grab a game-high six rebounds on a night the black and gold won the battle of the boards by 10. Junior Justin Tillman added six boards of his own and finished with 14 points. Three other Rams finished with double-digits. Senior Doug Brooks had 12 points after missing last week’s exhibition and finished with four a game-high four assists, just outpacing Jonathan Williams’ three assists and 10 points. Freshman Samir Doughty rounds out the group of double-digit scorers with 10 points of his own. The Rams outscored a somewhat undersized UNCA team by 14 points in the paint and did a much better job of holding on to the ball, turning it over just 14 times a week after 25 turnovers versus Queens. The win starts the black and gold at 1-0 on the season heading into a Tuesday night road matchup at Liberty. That game will tip at 8PM.